The holiday season has arrived which means it’s time to gather together with loved ones and celebrate. Although it is the most wonderful time of the year, the holiday season can cause physical and emotional stress. 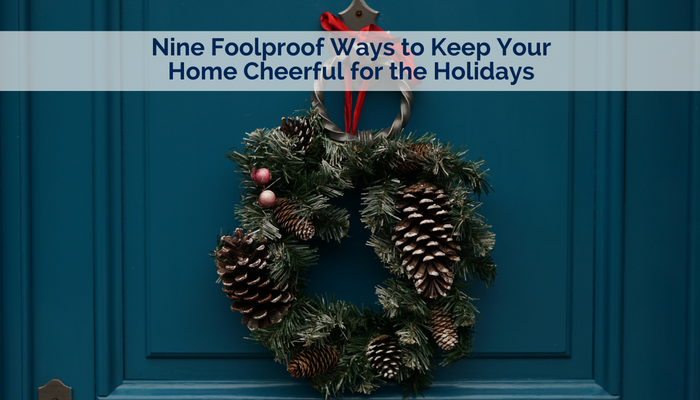 Here are nine foolproof ways to keep your holidays at home cheerful rather than stressful. 1- Exercise. Finding time to exercise amid all the other planned activities can be difficult. But, being regularly active actually helps manage physical and mental stress. If you find it difficult to get away from your loved ones, plan physical activities with them. Even if it’s cold outside you can find rigorous activities that are sure to help you work up a sweat. Here are some suggestions: skiing, ice skating, snowshoeing, etc. 2- Be helpful. Always pay attention to your loved ones. If you see they are feeling stressed, or need a helping hand, offer your help. This way, in a moment of stress, someone may be more willing to return the favor. 3- Breathe. If you are feeling overwhelmed, take a few minutes to try a breathing technique. This will help you organize your thoughts and release anxiety. After spending a few minutes breathing deeply, carry on with your tasks. You’ll find you will be able to focus better. 4- Take a moment. Having a moment to yourself is perhaps the most important tip to help you get through the holiday season feeling stress-free. It is also the most difficult to do. But, taking these small moments to yourself will help you feel happier. So, grab your favorite book, find a corner, and enjoy yourself. 5- Eat slowly. Eating a lot of delicious holiday meals is tradition this time of year. If you eat too quickly, you will most likely overeat. By consciously reminding yourself to eat slowly, you can avoid eating too much. With each bite, chew 30 times. This will help you not only eat slower, but will also help you enjoy each delicious holiday meal. 6- Set your security system. With a solid home security system, your family’s safety will be one less thing to worry about this holiday season. Whether you’re at home for the evening, or out and about, having your home locked up will ease your mind and help you enjoy every moment with your loved ones. 7- Stay healthy. Becoming ill or injured is the last thing you want during the holidays, but, unfortunately, it is more likely to happen during winter months. Be mindful of washing your hands regularly and keeping your walking paths free of ice. 8- Be calm. One of the biggest stress factors during the holiday season is yourself. Although it’s alright to hope for success for your planned activities, they don’t have to go perfectly. Just remember that spending time with your loved ones is more important than wanting things to go perfectly. 9- Stay positive. Murphy’s Law tells us if anything can go wrong, it will go wrong. If something does go wrong, focus on the positive. Who are you with? How can you learn from this? Trying to stay positive will eliminate unwarranted stress. These are your nine foolproof ways to keep your home cheerful rather than stressful. Enjoy a happy, safe, stress-free holiday season!